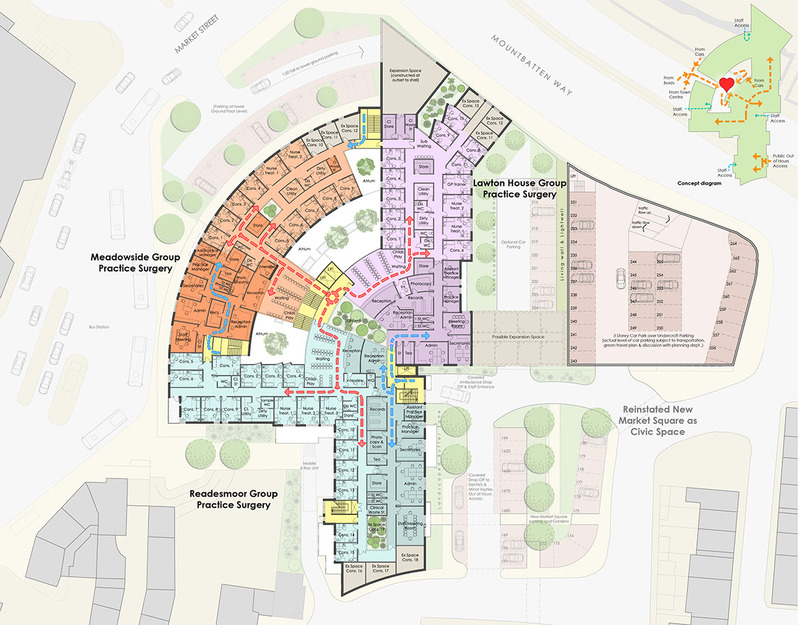 Congleton Primary Care Centre is a mixed use urban regeneration development on a prominent site in the centre of Congleton. As well as reproviding Library facilities, the building amalgamates Meadowside, Lawton House and Readesmoor Group Practice Surgeries. Community & Outpatient facilities, including Dentist, Minor Injuries, Minor Operations, X Ray, Sexual Health, Phlebotomy, Physiotherapy and General Treatment and Consulting Rooms are provided. Rising up four storeys around a central atrium, the building utilises a significant change in level across the site, to conceal car parking in semi basement and multi decked arrangements. The scheme involves the reinstatement of a historic Market Square and integration with an existing bus station. The project realises approximately 5,500 sq. metres of floor space.